I don’t know I have a great deal to contribute to the controversy of the use of a photograph by Shepard Fairey as a basis for his Obama posters, other than to be rather clear that this is definitively not a case of plagiarism. It may well however be a matter of copyright abuse. You can read a thorough examination of the US legal issues as would be expected by Carolyn E. Wright on her Photo Attorney blog, where she makes clear that although it is a case for the court to decide, she would be happy to take on for the copyright owner. In the past my own work has been used as a basis for work by various artists which has been sold or published. In at least one case I’ve received a standard licence fee for supplying a print or file for this use, but in most cases I’ve simply granted permission, knowing that the work produced will both be very different from my original both in appearance and usage. But although it seems clear to me that a licence should have been sought in this case, Fairey’s real offence seems to me to be laziness. There are many thousands of images of Obama that have been published in print and on the web, several of which were actually identified in the press as sources for the poster before Mannie Garcia’s image was located. It’s a good photograph, but not outstanding, the kind of head shot that any of us would take and be happy to have taken at an event where a well-known figure was speaking. What for me makes it a little more than most is actually the way the flag behind frames his head, at a similar angle to the tilt of Obama’s head, something Fairey has not copied. But I actually thing there are some considerably better pictures (of other people) on Garcia’s site. Had Fairey not chosen to have simply traced from this particular image, including its basic lines and some of its tonal structure (though in a much simplified form) but followed good practice in using a number of similar images as source material for his poster there would I think have been no claim to answer. But he should be accused of laziness or sloppy practice and cetainly not plagiarism. The poster is quite obviously a powerful work that although based on a photographic image has created something new and quite different (and frankly considerably more iconic), not any attempt to pass off Garcia’s photograph as his own. 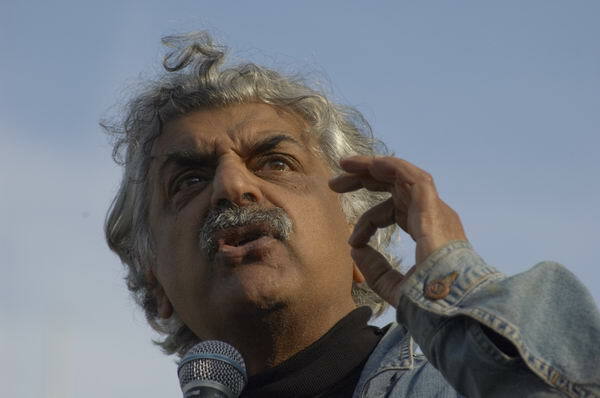 This might make a good poster in the unlikely event that Tariq Ali were ever to become our Prime Minister! This entry was posted on Friday, February 6th, 2009 at 12:23 pm and is filed under My Own Work, Photo Issues, Photographers. You can follow any responses to this entry through the RSS 2.0 feed. You can leave a response, or trackback from your own site. One small point to add. I’ve now got around to reading James Dansiger’s blog on his The Year in Pictures at http://pictureyear.blogspot.com/2009/02/fairey-tale-continues.html which gives some more information, in particular about the photographer. It was Dansiger who started the search on the blog for the photograph on which the poster was based, and once it was correctly identified, he contracted with AP and Mannie Garcia to exhibit and sell the work in a show including Fairey’s poster. Directly through this, Garcia (and presumably AP) have profited by the sale of 18 copies of the prints, although Garcia plans to donate most of the money to charity. Dansiger also makes a sensible proposal for an out of court settlement and reports Garcia as making clear that all want he wants is acknowledgement by the artist – the final words of the post are: ” I just want Shepard Fairey to say “Alright, you’re the guy. Thank you.”.